Call Me by Your Name struggles to be an original movie. Very little of what you see in the film hasn’t been seen before. It is a film about “coming-of-age,” “finding yourself,” “unexplored sexuality” and “life-changing relationships.” It has a teenage protagonist who has a life-changing summer due to his first homosexual relationship; one he views as “wrong” in the beginning but begins to embrace as the movie progresses; so that would be Blue is the Warmest Colour, Carol, Brokeback Mountain, Beach Rats and God’s Country to name but a few that have been here before. Not that familiarity and treading a well-worn path is a bad thing, just that if you are going to go down that route you better be sure that your approach is a good one and unfortunately, Call Me’s is not. For starters, it is painfully slow. It is set in the idyllic, 1980s Italy and takes full advantage of the scenery and location in staging the love story but also relishes in long, uncut shots of principle characters doing very little. Long meals, lounging and reading and boring archaeological discoveries. The movie moves at such a snails pace that you long for the relationship, which is telegraphed from the moment Armie Hammer appears, to actually begin. When the relationship does start, the movie doesn’t improve enough to justify the build. The two key characters do an excellent job and their performances are impressive. Armie Hammer shows another side to a slowly developing career, taking a role many actors this close to Hollywood stardom may avoid this early. The other side of the coin is teenager Timothee Chalamet, who shows a maturity to his performance that makes him an actor to watch in the future. Both are impressive in their reservations, passion and emotions but nothing of what they are given here is unique and it has been done better and more entertaining in many other movies. There are talking points. A scene involving a peach will mean that Call Me is not forgotten long after other movies outdo this one and there are even genuine moments of pathos and emotion that show what the actors can do and what this film could have been but none of it is enough and you are desperate for something much more dramatic and a lot less recognisable. 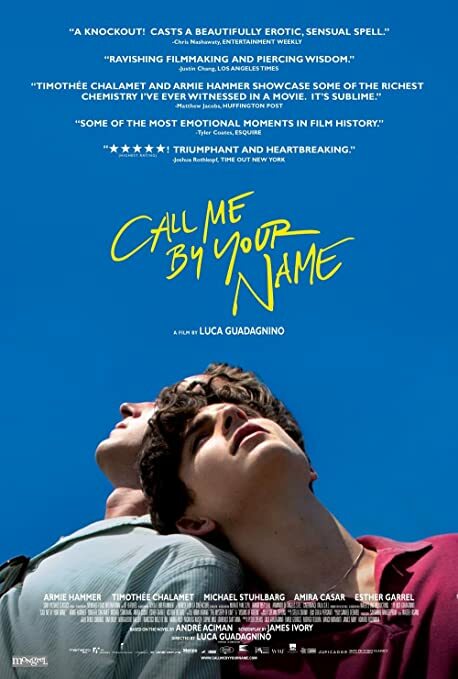 Overall, Call Me by Your Name does very little that is original and struggles to entertain, despite having a great cast, an idyllic setting and moments which show what a success this film could have been. Its refreshing to see someone not heaping ridiculous praise on this movie. I don’t get the huge amount of praise it has received. I was mostly bored! I watched this just before the Oscars came out just to see what the all the fuss was about and I thought it was good. Just not a life-changing and incredible film that a lot of people were going on about. I can totally hear you about the pacing, it was pretty slow on numerous occasions and the progression of the relationship between the two main characters felt natural at one point, and at others was tedious. I do feel like the emotional/dramatic aspects of the film worked well especially towards the end. Armie Hammer and Timothee Chalamet were really good, but I also really liked Michael Stuhlbarg in his supporting role.